This dance form has a beauty and grace all its own, and is the foundation for other dance styles. It is also stylised dancing, meaning that in order to perform it, dancers must learn a very specific technique. This technique was established centuries ago in the courts of Europe, and it has been evolving ever since as great teachers and dancers refine and add to the vocabulary of steps and movements that are unique to this discipline. Why do I have to take ballet? Ballet is not only for dancers who want to be ballerinas. Ballet is the first structured dance form. It has become a basic to any performing dance field. Ballet gives a dancer grace, presence and the technical expertise to turn out ones legs, to point feet, to extend legs higher and with ease, to dance with correct posture ( resulting in less injury) and more. Exercises learned in ballet class build coordination and muscle development that is needed in so many different styles. A good dancer is one who has good ballet basics and can duplicate any other style of dance she or he wishes to. When you apply your ballet technique to your jazz dancing you will notice a big improvement. The best dancers always take classical ballet instruction in addition to their jazz and other dance classes. 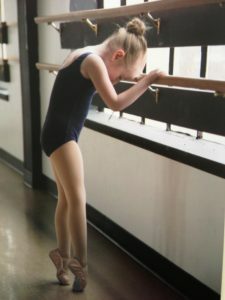 Pointework is an exaggeration of regular ballet technique, and you have to be well placed, strong and have a good understanding of classical technique before committing to pointework. Your teacher will tell you when you can do pointe.